North Coast Music - Welcome to the American Home of the 60s British Music Invasion! North Coast is just not another online music retailer. 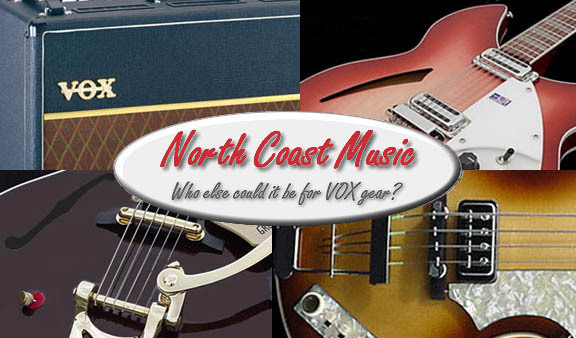 No, North Coast specializes in the online sale of instruments and replacement parts for the amps and guitars of the 1960s British Music Invasion: Vox amps, Rickenbacker guitars and basses and Hofner Beatle Basses. We also manufacture many hard to find and rare VOX parts, stands, trolleys, and cabinets under an exclusive license from Vox in the UK. Many of these items have not been in production for decades. North Coast travels the world locating original VOX suppliers as well as securing original Vox tooling to bring these vintage parts back into production. If it is a Vox replacement part you are after, and we don't have it, it probably isn't available anywhere. For new Vox, Rickenbacker, Gretsch, and Hofner products and replacement parts, please place your order online using our secure shopping cart. Have a question? You may contact us via email by clicking here, we do not offer phone service, sorry. North Coast Music does not offer any vintage or used Vox amps, guitars, or organs. © 1996-2017 North Coast Music, Cudahy WI. All rights reserved.